While we still don't have an official word on Thom Yorke's supposed New Moon contribution, today we found out that Death Cab for Cutie have definitely been tapped for the second instalment in the Twilight series. The band's new track, "Meet Me on the Equinox," which was composed and recorded specifically for the upcoming film's soundtrack, will debut on MTV's website September 13, the same day as the Video Music Awards. 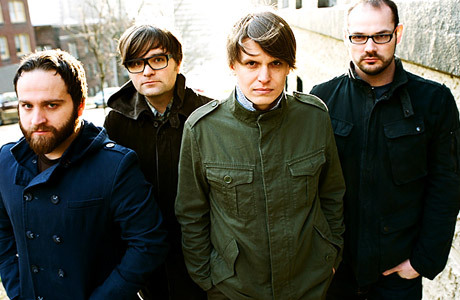 In an interview with MTV, Death Cab bassist Nick Harmer described the new track as "pretty dark and brooding, lyrically," adding that it's an upbeat song that "fits right into the Death Cab canon." Harmer also said that Death Cab actually share a lot of commonalities with the ridiculously popular vampire series. "I think that a lot of our songs in general concern a lot of the things the main characters in the books are going through: There's a lot of stuff about relationships beginning and ending, and the questioning that happens around being in love and falling out of love," he said. "That's a comfort zone for us, so a lot of the lyrical content [front-man] Ben [Gibbard] writes also happens to line up with what the characters are going through in the film. Basically, the Twilight series is about love, and that's a major theme for us. So it wasn't difficult for us at all." As for the entire New Moon soundtrack, that is set for release on October 20 on Atlantic Records. However, so far no other artists have been officially confirmed, though online rumours have pointed to Bon Iver, Grizzly Bear, Muse and Radiohead's Thom Yorke all being on the upcoming release.